A brief note of explanation concerning the origin of this book might prove of interest to the reader. Initially, it was envisaged as one volume in a series dealing with various aspects of physical processes in the chemical industry and it was intended that it should cover the mathematical techniques applied in the companion volumes. During the course of writing, however, it became increasingly evident that the contents could, with little modification, be of interest to a considerably wider readership than that for which the series was intended. It was therefore decided to publish the work in its own right. The aim of the authors throughout has been to produce a text of wide range from which the student could derive the maximum benefit with the minimum of assistance from other sources. 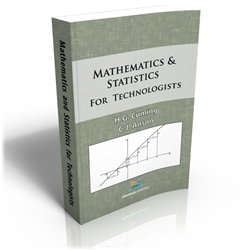 With this aim in view, the book starts with a revision course in basic algebra, geometry, and trigonometry, and subsequent chapters range over a wide field of mathematical techniques and their applications. Although the chapters are arranged in logical sequence, many are virtually self-contained and may be read in isolation. It is hoped that the inclusion of a large number of worked examples will materially assist the reader who is attempting to teach himself.